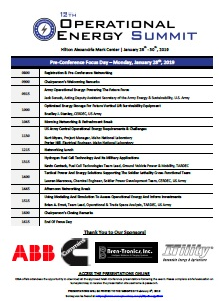 Welcome to the IDGA’s 12th Operational Energy Summit, focused on helping our military to face challenges and opportunities to use energy to maximize force effectiveness. Want to get the agenda sent straight to your inbox? Then just email idga@idga.org and we will send it over right away.